What creates the colors in Jupiter’s clouds? No one is sure. The thick atmosphere of Jupiter is mostly hydrogen and helium, elements which are colorless at the low temperatures of the Jovian cloud tops. Which trace elements provide the colors remains a topic of research, although small amounts of ammonium hydrosulfide are one leading candidate. What is clear from the featured color-enhanced image — and many similar images — is that lighter clouds are typically higher up than darker ones. 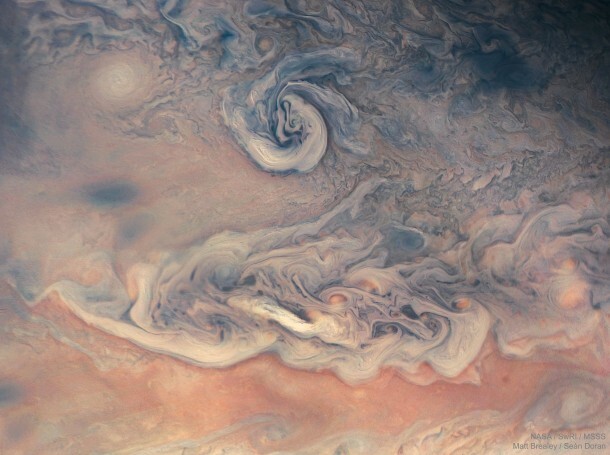 Pictured, light clouds swirl around reddish regions toward the lower right, while they appear to cover over some darker domains on the upper right. The featured image was taken by the robotic Juno spacecraft during its 14th low pass over Jupiter earlier this year. Juno continues in its looping elliptical orbit, swooping near the huge planet every 53 days and exploring a slightly different sector each time around.